It boasts a battery with a capacity of 2000 mAh, a tiny battery capacity for a 8 inch tablet. Battery capacity is the most accurate indicator of actual battery life. The phone's body has a depth of 8.73 mm, 88% thicker than a typical device in screen category. 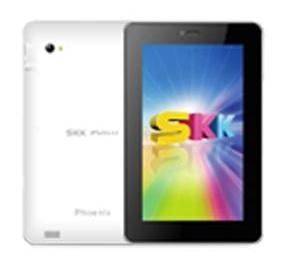 The SKK mobile PHOENIX has two cameras, a 5 megapixel front camera and a 8 megapixel rear camera. If SKK mobile PHOENIX isn't enough, you can expand its storage by up to microSD via microSD card.